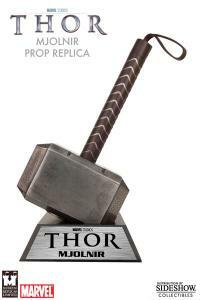 Sideshow Collectibles is proud to present the Thor Hammer Prop Replica from Museum Replicas. 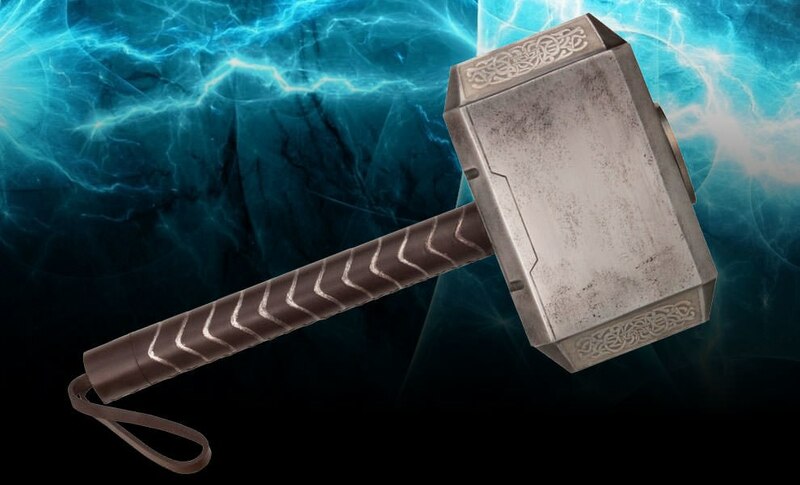 The god of thunder's chosen weapon is the mighty hammer known as Mjolnir. Given to him by his father Odin, the hammer is said to have the power to level mountains. 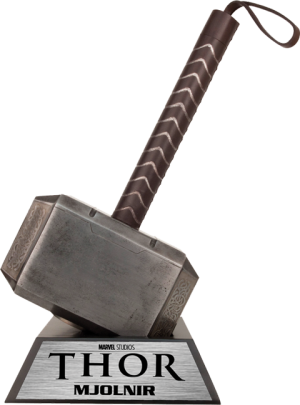 Using the original Marvel Studios prop, the Thor Hammer Prop Replica is expertly hand crafted from aged steel, features a wood handle, and is finished with aged, harness grade leather. This incredible replica measures 17 inches overall, the hammer head itself is approximately 8 inches long, 5 inches wide, and weighs in at an imposing 5 lbs. Includes a custom wood base that displays the hammer at the same angle it was found when first discovered on Earth. 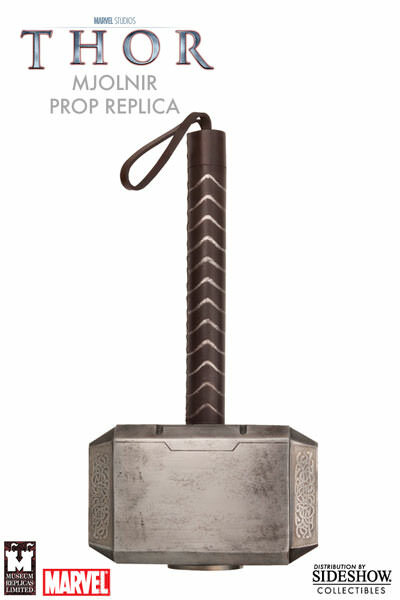 The 1:1 scale Thor Hammer Prop Replica makes an impressive addition to any collection. this piece is worth to have!!! i im a little dummy because i end it up return the item for some reason and i want it again!! but if you are one of the people who own one hold on to it!! the hammer display is awsome and the metal is REAL!!! AND FOR THAT PRICE IT WAS EVEN AWSOME!! Very excellent piece. 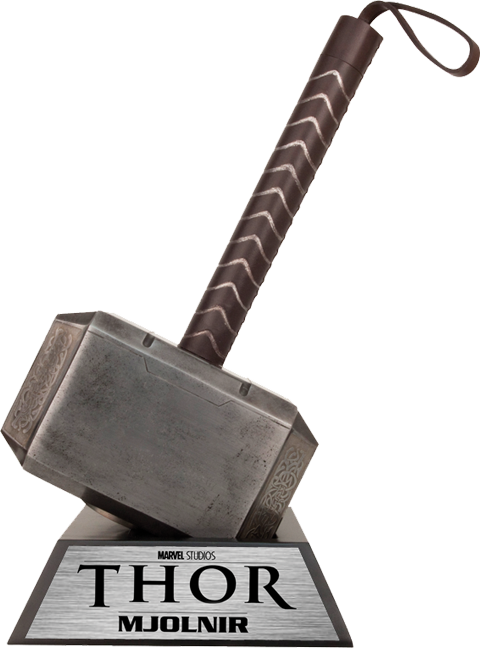 The hammer is based off the Thor movie, and not the hammer from The Avengers, or Thor 2. There are some differences in the handle for the latter movies, which make it look better. Nonetheless takes pride of place in my living room! 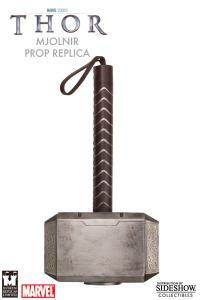 If you are a Thor fan and if you can wield one, Get it!. I picked up my hammer a few weeks ago at a local Sideshow distributor. Words are just not enough to describe the pure awesomeness. Absolutely LOVE this piece. Great to look at but even cooler to pick up and carry around the house. So realistic I have to tell people I had Odin remove the enchantment just so I could wield it.